Tuberculous pericardial effusion is a well-known complication of tuberculosis (TB). However, the greatest challenge in front of clinicians is its diagnosis as the conventional methods lack the required sensitivity and specificity of detection. The emergence of drug resistance and co-infections such as human immunodeficiency virus further complicates the situation making it difficult to diagnose such cases. GeneXpert technology is a major breakthrough in the field of TB diagnosis and has opened newer avenues for many new molecular tests to be launched in the future. The World Health Organization endorsed this technology in 2010 for rapid and simultaneous detection of Mycobacterium tuberculosis (MTB) and rifampicin (RIF) resistance. GeneXpert-MTB/RIF assay was highly recommended as an initial diagnostic platform in high burden countries for early and quick detection of TB cases. Until date, very few studies have evaluated the performance of this brilliant assay in pericardial effusion cases, thus, more studies are required to address the unanswered questions left so far. Our review attempts to recapitulate the achievements, the potential impacts and the prospective use of this novel technology in early diagnosis of TB, especially focussing pericardial effusion cases. In the era of vaccination and treatment, rapid diagnosis of some infectious diseases still remains a distant dream despite technological advances. Tuberculosis (TB) caused by Mycobacterium Tuberculosis (MTB) is one such disease that manifests itself in two forms, either pulmonary tuberculosis (PTB) or extrapulmonary tuberculosis (EPTB). Pulmonary TB is the deadliest form of the disease while EPTB is localized in areas other than lungs, especially lymph nodes, genitourinary tract, pleura, bones, joints, meninges, central nervous system, peritoneum, and other abdominal organs. Pericardial effusion is one such manifestation of EPTB. Pericardial effusion cases correlated to TB have been reported to be increasing over the years in developing countries (>60, and >80% with human immunodeficiency virus (HIV) infection). In this review, we provide an overview of the current knowledge in the field of pericardial effusion diagnosis caused by MTB. It is also an attempt to highlight the role of GeneXpert technology and its usage as future diagnostic tool for pericardial effusion. Although pulmonary TB is the leading cause of mortality, EPTB has not received high priority status from a public health perspective, the way pulmonary TB is being addressed internationally. EPTB has also significantly contributed in affecting disease transmission, TB-related morbidity and is responsible for life-threatening consequences. Hence, there is an urgent need for early diagnosis and treatment of EPTB cases as they do have a significant impact on treatment strategies. Early diagnosis and prompt treatment can save millions of lives. Rapid and accurate diagnosis would definitely lead to early initiation of effective treatment, but this is often difficult as the traditional methods lack the required sensitivity and specificity. ZN staining and culture methods remain the gold standard for the detection of pulmonary TB samples but have not proved to be very effective testing strategies for the diagnosis of TPE cases. Previously published reports suggest that ZN stainin, direct microscopy, and culture are all poorly sensitive for detecting MTB. These traditional methods are expensive, complex, delayed by 2-6 weeks and are less sensitive for the detection of EPTB, especially from pericardial effusion cases. Until date, there are no specific guidelines for diagnosis of TPE cases. Recently, Bayazit et al. introduced an enzyme-linked immunosorbent spot assay for counting the numbers of antimycobacterial effector T-cells that produce interferon (IFN)-gamma against MTB - specific antigens encoded by genes located in region of difference. However, it is very early to be fully dependent on this method as the feasibility and reliability of this assay for diagnosing TPE has not been evaluated by other studies. However, the last few years have witnessed the advancement of molecular tests that have very low negative predictive value and high positive predictive value (98-99%) for extrapulmonary cases. , These tests have completely revolutionized the field of TB diagnosis by targeting specific genes or gene segments, and have shortened the turnaround time of detection from weeks to days. Currently, many molecular methods are available for rapid diagnosis and identification of TB bacilli. In addition, these assays have contributed immensely for detection of drug resistance pattern in clinical samples reducing the turnaround time of detection. Nucleic acid amplification tests (NAATs) have proven their worth in EPTB cases by having very high positive predictive value, and with a sensitivity of 60-100% even with inadequate amount of sample. Polymerase chain reactions (PCRs) have also benefited clinicians in predicting disease outcome in MDR-TB cases by direct amplification of rpoB gene responsible for rifampicin (RIF) resistance in MTB. The diagnostic accuracy and effectiveness of PCR were also examined by Cegielski et al. in 13 specimens of pericardial fluid and 15 specimens of pericardial tissue from twenty patients. They reported that accurate diagnosis of TB was correctly made in 13 patients (81%); there was one false-positive result for a patient with Staphylococcus aureus pericarditis. Although these tests have become popular due to their sensitivity, specificity, speed and accuracy, still these techniques are not being utilized as widely as they were predicted to be used in resource-limiting settings. One such novel, automated real-time nucleic acid amplification technology is Xpert-MTB/RIF system. The GeneXpert-MTB/RIF method can simultaneously detect and identify MTB and resistance to RIF within two working hours. This technology was recommended and implemented by WHO in December 2010 in developing nations as a substitution over conventional methods for rapid detection of MTB in extrapulmonary samples. This Cepheid GeneXpert system is based on molecular beacon technology and performs ultrasensitive hemi nested PCR on clinical samples with an accurate (99-100%) diagnosis and detects RIF resistance in single assay. Being a closed system, this assay does not require much expertise and there is minimal risk of contamination and biohazard. Initially, the WHO endorsed the assay specifically for diagnosing pulmonary TB patients; recently attempts have been made to explore other affected areas including EPTB clinical samples. Emerging data suggests that this assay has the potential for diagnosing EPTB as the sensitivity and specificity were found to be almost similar for both PTB and EPTB cases. These facts are further supported by a large number of studies conducted until date. Ligthelm et al. showed excellent diagnostic accuracy of the Xpert assay in terms of sensitivity (96.7%) and specificity (86.6%) in patients with tuberculous lymphadenitis. Similarly, Lawn and Zumla demonstrated high sensitivity (81.3% for EPTB) of Xpert MB/RIF on large number of nonrespiratory samples. Furthermore, Iram et al. also compared and evaluated the performance of Xpert-MTB/RIF assay over conventional methods and reported that this assay is highly efficient in detecting TB, especially in smear-negative and in EPTB compared to the conventional ZN staining. Recently, published meta-analysis data by WHO have shown that GeneXpert achieved an overall pooled sensitivity of 88% (95% credible interval (CrI) 84-92%) and pooled specificity of 99% (95% CrI 98-99%) as investigated by 22 studies involving 9008 participants. Similarly, 21 studies (8880 participants) showed that the pooled sensitivity of GeneXpert was found to be 99% (95% CrI 98-99%) while the pooled sensitivity of smear microscopy was reported to be 65% (95% CrI 57-72%). Therefore, Xpert technology increased TB detection among culture-confirmed cases by 23% (95% CrI 15-32%). The performance of Xpert assay has been demonstrated for some types of EPTB such as TB lymphadenitis, pleural TB and TB meningitis. ,, However, there are no comprehensive data about TBP to guide clinical practice. Pandie et al. evaluated for the 1 st time the diagnostic accuracy of Xpert-MTB/RIF test in a large comprehensive study and reported that Xpert-MTB/RIF, when combined with either adenosine deaminase (ADA) or unstimulated IFN-gamma (uIFNγ), offers >97% sensitivity and specificity for TBP diagnosis. In addition, Sharma et al. 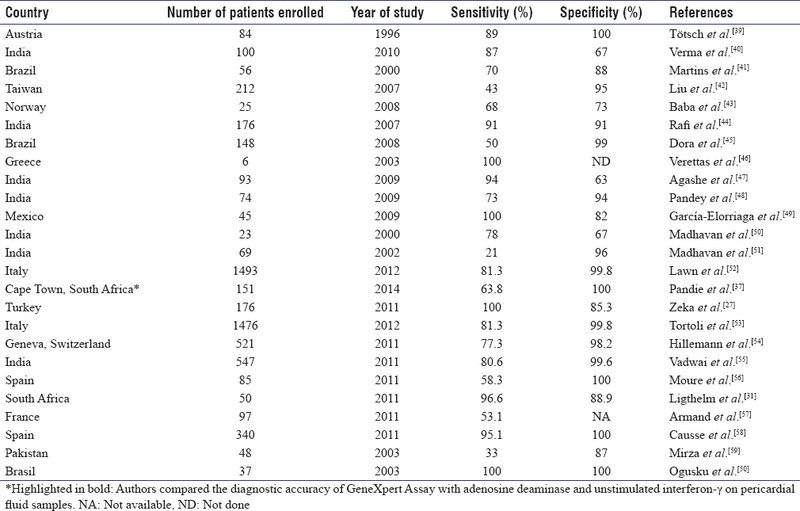 further evaluated the diagnostic performance of this assay in a cohort of 1274 patients enrolled in a tertiary care center in India and reported that the sensitivity and specificity of GeneXpert assay are high (71% and 95% respectively) compared to cultural methods. Summary of all the studies is performed are summarized in [Table 1] and [Table 2]. Pandie et al. evaluated for the 1 st time the diagnostic accuracy of Xpert-MTB/RIF test in a large comprehensive study and reported that Xpert-MTB/RIF when combined with either ADA or uIFNγ, offers > 97% sensitivity and specificity for TBP diagnosis. In his study, 151 consecutive patients with suspected TBP were enrolled at a single center in Cape Town, South Africa. MTB culture and/or pericardial histology served as the gold standard. Forty-nine percent (74/151) were classified as definite TBP, 33% (50/151) as probable TBP and 18% (27/151) as non TBP. Xpert-MTB/RIF had a sensitivity and specificity of 63.8% and 100%, respectively. Concentration of pericardial fluid by centrifugation and using standard sample processing did not improve Xpert-MTB/RIF accuracy. ADA (≥35 IU/L) and uIFNγ (≥44 pg/ml) both had a sensitivity of 95.7%98.5%) and a negative likelihood ratio of 0.05 (0.02 to 0.10). However, the specificity and positive likelihood ratio of uIFNγ was higher than ADA. The sensitivity and negative predictive value of both uIFNγ and ADA were higher than Xpert-MT/RIF. In Tortoli's study, 4% of the patients had pericardial, peritoneal or synovial effusions. They investigated consecutive extrapulmonary clinical specimens (1,068 patients) including both pediatric (494) and adult samples. They found an overall sensitivity and specificity of 81.3% and 99.8% for Xpert, in contrast, lower than 50% for cavitary fluids like pericardial effusion [Table 1] and [Table 2]. • Detection of Rifampicin resistance: Molecular beacon technology is employed for detection of RIF resistance wherein the 81bp core region of the rpoB gene encoding bacterial RNA polymerase is amplified using five different nucleic acid hybridization probes. , These molecular beacons are oligonucleotide probes which are covalently linked to fluorophore at one end and a quencher at the other end. These probes bind to the complementary and amplified rpoB gene sequence. Five differently labeled probes specific to different sequences within the wild type rpoB gene segment are used. Binding of the probe results in emission of florescence light indicating sensitivity of the strain to RIF. While, RIF resistance is predicted when there is mutation in rpoB gene segment that results in either delayed or less florescence of probes. Diagrammatic representation of GeneXpert assay is depicted in [Figure 1]. Figure 1: Schematic representation of GeneXpert technology depicting the step wise procedure of the assay. Hence, GeneXpert technology is a boon for resource limited settings for instant diagnosis and detection of resistance pattern against MTB. In addition, as sample processing, PCR amplification and detection are integrated in one single unit making the system fully automated, GeneXpert is definitely an attractive tool for point of care testing. The mortality rate of TB/HIV co-infection is rising annually in high burden countries including India; therefore, there is an urgent need for accurate diagnosis of TB among people living with HIV (PLHIV)/AIDS. It has also been reported by WHO that perinatal HIV have a 29-fold increased risk of TB compared to HIV-uninfected people. The clinical pattern, as well as the immune response to TB changes as the immune deficiency, progresses in HIV infected individuals. , In EPTB, smears tend to be negative because of paucity of TB bacilli at the onset of disease and HIV infection further complicates the scenario by expanding the horizon for other opportunistic infections. In HIV prevalent settings, GeneXpert is the best available option for quick diagnosis of TB cases for timely initiation of treatment. Studies conducted in South Africa and Ethiopia suggests high diagnostic accuracy of GenXpert for pulmonary TB among HIV infected individuals and reported significant increase in detection of TB cases (53%) with a smear-negative microscopy result. , Similarly, findings from South Korea and Greece suggest high positive predictive value (97.7%) of Xpert-MTB/RIF for simultaneous detection of RIF resistance. ,, Meta analysis data of PLHIV showed a statistically significant result wherein Xpert-MTB/RIF pooled sensitivity was 61% (95% CrI 42-79%) for smear-negative, culture-positive TB compared with 97% (95% CrI 91-99%) for smear-positive, culture-positive TB. Raizada et al. also reported high treatment success rate and recommends not only the revision of existing national policies for accurate diagnosis of TB among PLHIV but also that Xpert could serve as a primary testing strategy for TB confirmation and should be made available in HIV clinics. These compelling evidences clearly indicate that Xpert technology is a reliable option for preliminary diagnosis of TB among PLHIV where the risk of rapid progression to AIDS or MDR-TB is great. The only limitation of this incredible technology is its cost which prevents its widespread usage in resource constrained settings therefore its usage is restricted to those clinics or laboratories who can afford the assay. This assay is highly expensive compared to smear microscopy with one single machine costing around US$17,000-$62,000. Even after negotiated discounts for high burden countries, each single use cartridge cost US$17-$120, and there are additional charges for delivery, installation and annual maintenance of the machine. Its cost and other logistic constraints restrict its usage and implementation as point of care setting. In addition, the applicability of this assay has also not been evaluated on a large scale in pediatric population. Though cost of this machine is major challenge for low and middle-income countries but looking at the increasing number of PTB and EPTB cases, implementation of this assay is the need of the hour to control this deadly disease from killing more people. There is paucity of clinical data on the diagnosis and management of pericardial effusion cases. We recommend the usage of Xpert TB/RIF assay for early diagnosis of pericardial effusion cases as it is not just a test device platform; it is an exciting innovation in TB diagnostics that will also pave the way for many more affordable tests to be launched in future. Implementation of this assay in developing nations will dramatically improve rapid diagnosis of EPTB. To realize this dream of implementing this assay at the doorstep of every HIV/TB clinic, many stakeholders including policy makers, regulators needs to come together to provide appropriate funds for improving public health sectors. Lee JY. Diagnosis and treatment of extrapulmonary tuberculosis. Tuberc Respir Dis (Seoul) 2015;78:47-55. Mayosi BM, Burgess LJ, Doubell AF. Tuberculous pericarditis. Circulation 2005;112:3608-16. Global Tuberculosis Report; 2015. Available from: . [Last accessed on 2015 Dec 25]. Global Tuberculosis Report; 2014. Available from: . [Last accessed on 2015 Dec 25]. Sandgren A, Hollo V, van der Werf MJ. Extrapulmonary tuberculosis in the European Union and European Economic Area, 2002 to 2011. Euro Surveill 2013;18. pii: 20431. Larrieu AJ, Tyers GF, Williams EH, Derrick JR. Recent experience with tuberculous pericarditis. Ann Thorac Surg 1980;29:464-8. Fewell JW, Cohen RV, Miller CL. Tuberculouspericarditis. In: Cortes FM, editor. The Pericardium Andits Disorders. Springfield: Charles C Thomas; 1971. p. 140. Sainani GS, Sainani RG. Clinical study, tuberculosis pericardial effusion. Indian J Clin Pract 2012;22:371-4. Strang JI, Nunn AJ, Johnson DA, et al. Management of tuberculous constrictive pericarditis and tuberculous pericardial effusion in Transkei: results at 10 years follow-up. QJM 2004;97:525-35. Ntsekhe M, Shey Wiysonge C, Commerford PJ, Mayosi BM. The prevalence and outcome of effusive constrictive pericarditis: A systematic review of the literature. Cardiovasc J Afr 2012;23:281-5. Petrofsky M. Management of malignant pericardial effusion. J Adv Pract Oncol 2014;5:281-9. Imazio M, Adler Y. Management of pericardial effusion. Eur Heart J 2013;34:1186-97. Fowler NO. Tuberculous pericarditis. JAMA 1991;266:199-203. Rooney JJ, Crocco JA, Lyons HA. Tuberculous pericarditis. Ann Intern Med 1970;72:73-81. Hancock EW. Cardiac tamponade. Med Clin North Am 1979;63:223-37. Strang JI. Tuberculous pericarditis in Transkei. Clin Cardiol 1984;7:667-70. Lin CT, Liu CJ, Lin TK, Chen CW, Chen BC, Lin CL. Myxedema associated with cardiac tamponade. Jpn Heart J 2003;44:447-50. Omura Y, Ugi S, Sugimoto T, Nishio Y, Maegawa H, Kashiwagi A. Massive pericardial effusion secondary to Hashimoto′s disease. Eur J Intern Med 2007;18:438-40. Sagristà-Sauleda J, Mercé AS, Soler-Soler J. Diagnosis and management of pericardial effusion. World J Cardiol 2011;3:135-43. Khalil MZ. Challenges in management of pericardial effusion in patients with HIV/AIDS. J Antivir Antiretrovir 2012;5:1. Burgess LJ, Reuter H, Carstens ME, Taljaard JJ, Doubell AF. The use of adenosine deaminase and interferon-gamma as diagnostic tools for tuberculous pericarditis. Chest 2002;122:900-5. Purohit M, Mustafa T. Laboratory diagnosis of extra-pulmonary tuberculosis (EPTB) in resource-constrained setting: State of the art, challenges and the need. J Clin Diagn Res 2015;9:EE01-6. Tanzania Social Sector Review, World Bank Report; 1999. Available from: 13/tanzania-social-sector-review. [Last accessed on 2015 Dec 30]. Bayazit YA, Bayazit N, Namiduru M. Mycobacterial cervical lymphadenitis. ORL J Otorhinolaryngol Relat Spec 2004;66:275-80. Bisht D. Can newer diagnostic microbiological assays guide early tuberculosis management? Indian J Tuberc 2011;58:51-3. 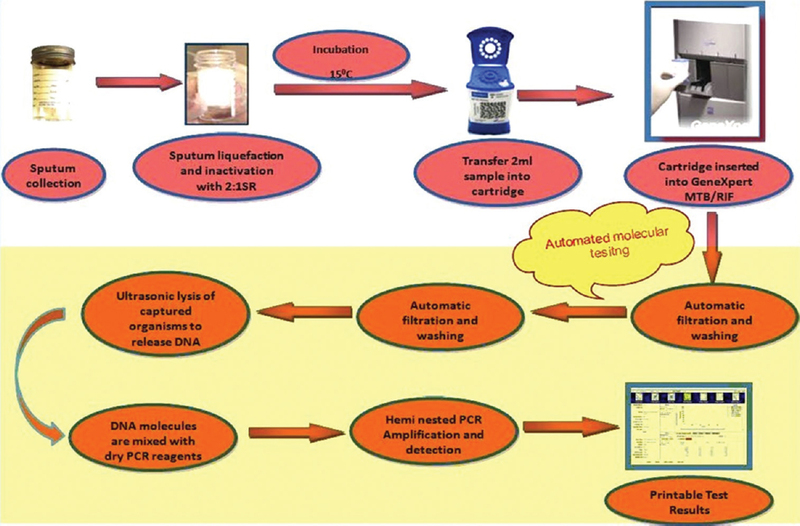 Zeka AN, Tasbakan S, Cavusoglu C. Evaluation of the GeneXpert MTB/RIF assay for rapid diagnosis of tuberculosis and detection of rifampin resistance in pulmonary and extrapulmonary specimens. J Clin Microbiol 2011;49:4138-41. Cegielski JP, Devlin BH, Morris AJ, Kitinya JN, Pulipaka UP, Lema LE, et al. Comparison of PCR, culture, and histopathology for diagnosis of tuberculous pericarditis. J Clin Microbiol 1997;35:3254-7. Van Rie A, Page-Shipp L, Scott L, Sanne I, Stevens W. Xpert(®) MTB/RIF for point-of-care diagnosis of TB in high-HIV burden, resource-limited countries: Hype or hope? Expert Rev Mol Diagn 2010;10:937-46. Alvarez-Uria G, Azcona JM, Midde M, Naik PK, Reddy S, Reddy R. Rapid diagnosis of pulmonary and extrapulmonary tuberculosis in HIV-infected patients. comparison of LED fluorescent microscopy and the GeneXpert MTB/RIF assay in a district hospital in India. Tuberc Res Treat 2012;2012:932862. Ligthelm LJ, Nicol MP, Hoek KG, Jacobson R, van Helden PD, Marais BJ, et al. Xpert MTB/RIF for rapid diagnosis of tuberculous lymphadenitis from fine-needle-aspiration biopsy specimens. J Clin Microbiol 2011;49:3967-70. Iram S, Zeenat A, Hussain S, Wasim Yusuf N, Aslam M. Rapid diagnosis of tuberculosis using Xpert MTB/RIF assay - Report from a developing country. Pak J Med Sci 2015;31:105-10. The Use of the Xpert MTB/RIF Assay for the Detection of Pulmonary and Extrapulmonary Tuberculosis and Rifampicin Resistance in Adults and Children. Xpert Group Meeting Report; 2013. Available From: http://www.stoptb.org/wg/gli/assets/documents/Xpert%20Meeting%20Report%2024102013% 20%20Pre%20 publication%20FINAL.pdf. [Last accessed on 2015 Dec 30]. Meldau R, Peter J, Theron G, Calligaro G, Allwood B, Symons G, et al. Comparison of same day diagnostic tools including Gene Xpert and unstimulated IFN-γ for the evaluation of pleural tuberculosis: A prospective cohort study. BMC Pulm Med 2014;14:58. Patel VB, Theron G, Lenders L, Matinyena B, Connolly C, Singh R, et al. Diagnostic accuracy of quantitative PCR (Xpert MTB/RIF) for tuberculous meningitis in a high burden setting: A prospective study. PLoS Med 2013;10:e1001536. Pandie S, Peter JG, Kerbelker ZS, Meldau R, Theron G, Govender U, et al. Diagnostic accuracy of quantitative PCR (Xpert MTB/RIF) for tuberculous pericarditis compared to adenosine deaminase and unstimulated interferon-γ in a high burden setting: A prospective study. BMC Med 2014;12:101. Sharma SK, Kohli M, Chaubey J, Yadav RN, Sharma R, Singh BK, et al. Evaluation of Xpert MTB/RIF assay performance in diagnosing extrapulmonary tuberculosis among adults in a tertiary care centre in India. Eur Respir J 2014;44:1090-3. Tötsch M, Böcker W, Brömmelkamp E, Fille M, Kreczy A, Ofner D, et al. Diagnostic value of different PCR assays for the detection of mycobacterial DNA in granulomatous lymphadenopathy. J Pathol 1996;178:221-6. Verma P, Jain A, Patra SK, Gandhi S, Sherwal BL, Chaudhary M. Evaluation of polymerase chain reaction (PCR) using hupB gene in diagnosis of tuberculous lymphadenitis in fine needle aspirates. Indian J Tuberc 2010;57:128-33. Martins LC, Paschoal IA, Von Nowakonski A, Silva SA, Costa FF, Ward LS. Nested-PCR using MPB64 fragment improves the diagnosis of pleural and meningeal tuberculosis. Rev Soc Bras Med Trop 2000;33:253-7. Liu KT, Su WJ, Perng RP. Clinical utility of polymerase chain reaction for diagnosis of smear-negative pleural tuberculosis. J Chin Med Assoc 2007;70:148-51. Baba K, Pathak S, Sviland L, Langeland N, Hoosen AA, Asjo B, et al. Real-time quantitative PCR in the diagnosis of tuberculosis in formalin-fixed paraffin-embedded pleural tissue in patients from a high HIV endemic area. Diagn Mol Pathol 2008;17:112-7. Rafi W, Venkataswamy MM, Ravi V, Chandramuki A. Rapid diagnosis of tuberculous meningitis: A comparative evaluation of in-house PCR assays involving three mycobacterial DNA sequences, IS6110, MPB-64 and 65 kDa antigen. J Neurol Sci 2007;252:163-8. Dora JM, Geib G, Chakr R, Paris FD, Mombach AB, Lutz L, et al. Polymerase chain reaction as a useful and simple tool for rapid diagnosis of tuberculous meningitis in a Brazilian tertiary care hospital. Braz J Infect Dis 2008;12:245-7. Verettas D, Kazakos C, Tilkeridis C, Dermon A, Petrou H, Galanis V. Polymerase chain reaction for the detection of Mycobacterium tuberculosis in synovial fluid, tissue samples, bone marrow aspirate and peripheral blood. Acta Orthop Belg 2003;69:396-9. Agashe V, Shenai S, Mohrir G, Deshmukh M, Bhaduri A, Deshpande R, et al. Osteoarticular tuberculosis - Diagnostic solutions in a disease endemic region. J Infect Dev Ctries 2009;3:511-6. García-Elorriaga G, Gracida-Osorno C, Carrillo-Montes G, González-Bonilla C. Clinical usefulness of the nested polymerase chain reaction in the diagnosis of extrapulmonary tuberculosis. Salud Publica Mex 2009;51:240-5. Madhavan HN, Therese KL, Gunisha P, Jayanthi U, Biswas J. Polymerase chain reaction for detection of Mycobacterium tuberculosis in epiretinal membrane in Eales′ disease. Invest Ophthalmol Vis Sci 2000;41:822-5. Madhavan HN, Therese KL, Doraiswamy K. Further investigations on the association of Mycobacterium tuberculosis with Eales′ disease. Indian J Ophthalmol 2002;50:35-9. Lawn SD, Kerkhoff AD, Vogt M, Wood R. High diagnostic yield of tuberculosis from screening urine samples from HIV-infected patients with advanced immunodeficiency using the Xpert MTB/RIF assay. J Acquir Immune Defic Syndr 2012;60:289-94. Hillemann D, Rüsch-Gerdes S, Boehme C, Richter E. Rapid molecular detection of extrapulmonary tuberculosis by the automated GeneXpert MTB/RIF system. J Clin Microbiol 2011;49:1202-5. Vadwai V, Boehme C, Nabeta P, Shetty A, Alland D, Rodrigues C. Xpert MTB/RIF: A new pillar in diagnosis of extrapulmonary tuberculosis? J Clin Microbiol 2011;49:2540-5. Moure R, Muñoz L, Torres M, Santin M, Martín R, Alcaide F. Rapid detection of Mycobacterium tuberculosis complex and rifampin resistance in smear-negative clinical samples by use of an integrated real-time PCR method. J Clin Microbiol 2011;49:1137-9. Armand S, Vanhuls P, Delcroix G, Courcol R, Lemaître N. Comparison of the Xpert MTB/RIF test with an IS6110-TaqMan real-time PCR assay for direct detection of Mycobacterium tuberculosis in respiratory and nonrespiratory specimens. J Clin Microbiol 2011;49:1772-6. Causse M, Ruiz P, Gutiérrez-Aroca JB, Casal M. Comparison of two molecular methods for rapid diagnosis of extrapulmonary tuberculosis. J Clin Microbiol 2011;49:3065-7. Mirza S, Restrepo BI, McCormick JB, Fisher-Hoch SP. Diagnosis of tuberculosis lymphadenitis using a polymerase chain reaction on peripheral blood mononuclear cells. Am J Trop Med Hyg 2003;69:461-5. Ogusku MM, Sadahiro A, Hirata MH, Hirata RD, Zaitz C, Salem JI. PCR in the diagnosis of cutaneous tuberculosis. Braz J Microbiol 2003;34:165-70. Zamirian M, Mokhtarian M, Motazedian MH, Monabati A, Reza Rezaian G. Constrictive pericarditis: Detection of Mycobacterium tuberculosis in paraffin-embedded pericardial tissues by polymerase chain reaction. Clin Biochem 2007;40:355-8. Theron G, Zijenah L, Chanda D, Clowes P, Rachow A, Lesosky M, et al. Feasibility, accuracy, and clinical effect of point-of-care Xpert MTB/RIF testing for tuberculosis in primary-care settings in Africa: A multicentre, randomised, controlled trial. Lancet 2014;383:424-35. Chen Y, Brennessel D, Walters J, Johnson M, Rosner F, Raza M. Human immunodeficiency virus-associated pericardial effusion: Report of 40 cases and review of the literature. Am Heart J 1999;137:516-21. Sagristà-Sauleda J, Permanyer-Miralda G, Soler-Soler J. Tuberculous pericarditis: Ten year experience with a prospective protocol for diagnosis and treatment. J Am Coll Cardiol 1988;11:724-8. Agner RC, Gallis HA. Pericarditis: Differential diagnostic considerations. Arch Intern Med 1979;139:407-12. Hugo-Hamman CT, Scher H, De Moor MM. Tuberculous pericarditis in children: A review of 44 cases. Pediatr Infect Dis J 1994;13:13-8. Aggeli C, Pitsavos C, Brili S, Hasapis D, Frogoudaki A, Stefanadis C, et al. Relevance of adenosine deaminase and lysozyme measurements in the diagnosis of tuberculous pericarditis. Cardiology 2000;94:81-5. Banada PP, Sivasubramani SK, Blakemore R, Boehme C, Perkins MD, Fennelly K, et al. Containment of bioaerosol infection risk by the Xpert MTB/RIF assay and its applicability to point-of-care settings. J Clin Microbiol 2010;48:3551-7. Lawn SD, Nicol MP. Xpert® MTB/RIF assay: Development, evaluation and implementation of a new rapid molecular diagnostic for tuberculosis and rifampicin resistance. Future Microbiol 2011;6:1067-82. Blakemore R, Story E, Helb D, Kop J, Banada P, Owens MR, et al. Evaluation of the analytical performance of the Xpert MTB/RIF assay. J Clin Microbiol 2010;48:2495-501. Tyagi S, Kramer FR. Molecular beacons: Probes that fluoresce upon hybridization. Nat Biotechnol 1996;14:303-8. Piatek AS, Tyagi S, Pol AC, Telenti A, Miller LP, Kramer FR, et al. Molecular beacon sequence analysis for detecting drug resistance in Mycobacterium tuberculosis. Nat Biotechnol 1998;16:359-63. Xpert TB HIV Note WHO. Available From: http://www.who.int/tb/challenges/hiv/Xpert_TBHIV_Information_Note_final.pdf. [Last accessed on 2015 Dec 30]. Agarwal S, Roy D, Chauhan LS. TB-HIV Co-infection: A Lethal Combination. Ch. 16. Available from: http://www.tbcindia.nic.in/pdfs/Tuberculosis %20Control%20in%20India16.pdf. [Last accessed on 2015 Dec 30]. Raizada N, Sachdeva KS, Sreenivas A, Kulsange S, Gupta RS, Thakur R, et al. Catching the missing million: Experiences in enhancing TB & DR-TB detection by providing upfront Xpert MTB/RIF testing for people living with HIV in India. PLoS One 2015;10:e0116721. Theron G, Peter J, van Zyl-Smit R, Mishra H, Streicher E, Murray S, et al. Evaluation of the Xpert MTB/RIF assay for the diagnosis of pulmonary tuberculosis in a high HIV prevalence setting. Am J Respir Crit Care Med 2011;184:132-40. Balcha TT, Sturegård E, Winqvist N, Skogmar S, Reepalu A, Jemal ZH, et al. Intensified tuberculosis case-finding in HIV-positive adults managed at Ethiopian health centers: Diagnostic yield of Xpert MTB/RIF compared with smear microscopy and liquid culture. PLoS One 2014;9:e85478. Osman M, Simpson JA, Caldwell J, Bosman M, Nicol MP. GeneXpert MTB/RIF version G4 for identification of rifampin-resistant tuberculosis in a programmatic setting. J Clin Microbiol 2014;52:635-7. Kwak N, Choi SM, Lee J, Park YS, Lee CH, Lee SM, et al. Diagnostic accuracy and turnaround time of the Xpert MTB/RIF assay in routine clinical practice. PLoS One 2013;8:e77456. Ioannidis P, Papaventsis D, Karabela S, Nikolaou S, Panagi M, Raftopoulou E, et al. Cepheid GeneXpert MTB/RIF assay for Mycobacterium tuberculosis detection and rifampin resistance identification in patients with substantial clinical indications of tuberculosis and smear-negative microscopy results. J Clin Microbiol 2011;49:3068-70. World Health Organization. Tuberculosis Diagnostics Xpert MTB/RIF; 2013. Available from: http://www.who.int/tb/publications/Xpert_factsheet.pdf. [Last accessed on 2015 Dec 30]. World Health Organization. Stop TB Department. Roadmap for Rolling Out Xpert MTB/RIF for Rapid Diagnosis of TB and MDR-TB; 2010. Available from: http://www.who.int/tb/laboratory/roadmap_xpert_mtb-rif.pdf. [Last accessed on 2015 Dec 25]. Meyer-Rath G, Schnippel K, Long L, MacLeod W, Sanne I, Stevens W, et al. The impact and cost of scaling up GeneXpert MTB/RIF in South Africa. PLoS One 2012;7:e36966. Xpert MTB/RIF Assay for the Diagnosis of Pulmonary and Extrapulmonary TB in Adults and Children, Policy Update. Available from: http://www.apps.who.int/iris/bitstream/10665/112472/1/9789241506335_eng.pdf?ua=1. [Last accessed on 2015 Dec 30]. World Health Organization. Stop TB Partnership, UNITAID. Available from: http://www.who.int/tb/features_archive/TBXpert_briefing_note.pdf. [Last accessed on 2015 Dec 25]. Sachdeva KS. Central TB Division, Ministry of Health & Family Welfare, Government of India. Available from: http://www.stoptb.org/wg/gli/assets/documents/M7/3.%20SACHDEVA%20_commentary.pdf. [Last accessed on 2016 Jan 15]. GeneXpert TB Test. Available from: http://www.tbfacts.org/xpert -tb-test. [Last accessed on 2015 Dec 30].